EyePeterborough > News > Peterborough > Council tax 2019-20 – What’s it mean for you? 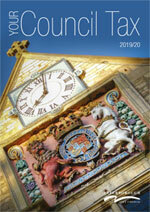 At a full council meeting on Wednesday 13 March, 2019 Peterborough City Council approved an increase to council tax by 2.99 per cent. Police and Crime Commissioner is rising by 12 per cent and the fire authority by three per cent. What does this mean for Eye residents? * Where figures have been rounded, there may be a slight discrepancy between the total and the sum of constituent parts. This excludes the Police and Crime Commissioner for Cambridgeshire, Cambridgeshire & Peterborough Fire Authority and the Parish precept but does include the recent increases caused by the social care precept. Each property is in one of eight bands according to its estimated value on the 1 April 1991. You can find out the council tax band for your home by looking up your property on GOV.UK using your postcode. All bands are based on a fraction of the band D cost. * The Public Works Loan Board (PWLB) is a statutory body that issues loans to local authorities, and other specified bodies, from the National Loans Fund, operating within a policy framework set by HM Treasury. This borrowing is mainly for capital projects. As far as outstanding investments. ** A money market fund is a type of mutual fund that invests in short-term debt instruments and is considered risk-free.